9. There is more variety of actors and actresses so it’s difficult to become bored from watching the same people over and over again. – You’d want to tour the filming locations because it was shown so beautifully. – The music matches well with the drama and enhances viewers’ experience. – Korean dramas usually focus mainly on their leading actors and actresses and have very few subplots. Hence, there is ample time for character development. Also, the characters would have a certain aspect of their personalities and/or behaviors that is only unique to them. – Not only between romantic couples, but also parent and child. – They make you laugh until your tummy hurts, cry because you symphatize so much with the characters, angry that you’d want to throw heavy objects at the TV screen, and optimistic because of the newly discovered life lessons and perspectives. – Not only from veterans, but also from young stars and child actors. Honestly speaking, you can look great but if you can’t act, then I can’t help you because my attention will soon wander to something better. If the above name does not ring any bell for you then I have one thing to say: where have you been?! I mean, Bi is one of the biggest stars, with soldout concerts all over Asia! Not only is he a successful music artiste, but he is also a popular actor. In the acting relm, most fans know him as Lee Young Jae in the Korean romantic comedy Full House. One quick glance at a picture of Bi and most people would say that he’s not goodlooking. Heck, the first time I showed his picture to one of my friends and we were watching Full House together, she thought there was a problem with my sight! However, Bi’s appeal is not based on first impressions, but through watching his performances both onstage and onscreen. I agree that he does not have the “traditional” handsome face, but he has something more important than that: charisma. He walks into a room and you’d notice him because he commands your attention. His adorable smile and babyface also give him the boyish charm that women from all ages go crazy for (yes, I’m one of them). In addition, his well-toned body with washboard abs and his 6 ft.+ tall stature add to the star package. Recently, I was watching KBS’s Photo Documentary about Bi and the narrator made a very good comment. “Bi has the face of a boy but a body of a man.” Similarly, in the clip where a hilarious prank was played on Bi and actress Kim Sun Ah, she was asked whether or not she sees him as a kid and she said “no” because how could she when his body is so manly. No doubt about it, Bi is one talented man. He’s a good singer, dances well (his dances are NOT “spastic”! ), and works with his dancers to choreograph all the dance performances. He is constantly thinking about ideas to improve his performances or concepts for his next projects. For his concerts, he is also an active participant in many aspects of the concert preparation process. Recently, I learned that he also contributes to the designing of his stage outfits! Bi’s debut album was released in 2002, entitled Bad Man. His next album was How to Escape from the Sun, released in 2003. 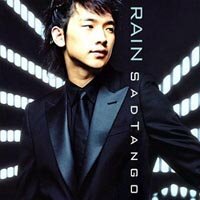 His latest Korean album, It’s Raining, came out in 2004. He also has several Japanese singles out currently, including “Sad Tango” and “Slowly.” My favorite songs on all of Bi’s albums include “How to Escape from the Sun” and “Not Used To,” which he dedicated to his mother who has passed away due to illness. In the coming months, Bi will release his first Japanese album and his fourth Korean album. When Bi is performing as an actor, he uses his real name “Jung Ji Hoon.” He debut as an actor in the 2002 sitcom Orange. 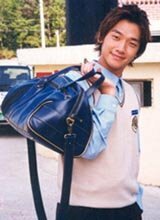 His first leading role was in Sang Doo, Let’s Go to School! However, it wasn’t until the airing of Full House with Song Hye Gyo that he was more widely known across Asia and his popularity soared as an actor. Following Full House, JJH starred in the drama A Love To Kill. Sadly, the ratings for A Love To Kill wasn’t as high as expected even though he had put alot of effort into the role. However, his effort did not go unnoticed because he was nominated for the 2005 KBS Best Performance Award in the company of other veteran actors. For the past year, JJH has been working with aclaimed director Park Chan Wook (Oldboy, Sympathy for Lady Vengeance) on the romantic comedy Although I’m a Cyborg, It’s Okay. The movie, set to be released later this year, is JJH’s debut film. Although, Full House was a joy to watch and it was the show that got me into Korean drama, Sang Doo, Let’s Go to School! is my favorite out of the three dramas. (I have not seen his debut sitcom Orange.) Not only that, Sang Doo, Let’s Go to School! is one of my favorite dramas out of ALL of the ones that I’ve seen. Bi (Jung Ji Hoon) is the first artiste that I’ve “idolized,” meaning I not only became a fan of his work, but I also actively search for more information about him and purchased all three of his Korean albums and his concert DVD (which is saying alot because I’m very stingy with money). In addition to his looks and talent, I also admire his work ethics and personality; he’s extremely hardworking and very humble. Between Bi the music artiste and JJH the actor, I like JJH the actor just a little bit more. What that means is that I want to watch all the shows that JJH is in (post-Full House), while I don’t necessarily have to catch all the songs that he releases. Although my “love” for him is beginning to fade, as long as he produces quality work and his personality remains unchanged, I will always be his fan.